Palm Springs, CA-Feb 1, 2011 – Multi-run innings spelled success for the Canada A’s and Palm Springs Chill on Tuesday in the California Winter League. The A’s used a 10 run third inning in the early game to beat the Coyotes 14-7, while the Chill scored six in the fifth to beat the first place Coachella Valley Snowbirds 11-5. After taking a 2-0 lead on a Scott Van Dusseldorp two-RBI hit in the second, the A’s punched out three infield singles against Joe Scumaci to keep their ten run third inning rolling. Ruben Perez notched an RBI single to the outfield that kept the nightmare going for Scumaci who is tagged with his first loss of the season. 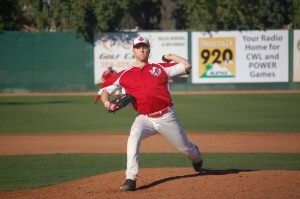 Meanwhile Canada starter Kevin Piggot allowed just one run to the Coyotes through five innings on his way to his first win of the season. Piggot surrendered just 6 hits while striking out three. In game two the Chill snuck out on top early 3-0. Then, with the help of two walks and two errors, Palm Springs opened the floodgates against Coachella Valley for six runs in the fifth. RBI singles from Chris Round and Jonathan Cluff complimented a run scoring double off the bat of Alex Cowart as the Chill took a 9-0 lead after five. Andrew Kuhn supported the Chill’s offensive effort with his best game to date. Kuhn chipped in three hits, three RBI and scored a run in the Palm Springs win. Starter Daniel Stenavich shut the Snowbirds down over the first four innings. The righty allowed just one hit and struck out six before giving way to Mike Jackson Jr. to start the fifth. Jackson picked up the scoreless mantle for two innings and eventually allowed just one run over three to qualify for his first win. Tomorrow all four teams are in action again. The Chill host the A’s at 10 a.m. while the Coyotes and Snowbirds square off at 1 p.m. Join us for all the action at Palm Springs Stadium, or follow it on your computer at www.californiawinterleague.com. Picture-Mike Stier tosses in relief for Canada in game 1.